The short answer is, no it does not have to be sold and is usually not sold. The discussion about the family home can be an emotional one for a divorcing couple. There are many considerations and arguments for and against selling, but what happens if the parties cannot reach an agreement? Generally speaking, in Texas, if the home was purchased during the marriage, it is community property (with a few exceptions), and the court divides the EQUITY (not the home itself). Each spouse may have a community property interest, but the question of whether the home must be sold is not cut and dry. Let’s go into some detail on how these situations often play out. Texas is a community property state, so, with some exceptions, all property acquired by either spouse during the marriage is known as community property. It doesn’t matter who is on the title or deed. For example, a home (or truck, or boat, etc.) can be titled in the name of one spouse, but in the eyes of the court, if it was obtained during the marriage it is community property. Property obtained prior to the marriage, on the other hand, or property that was inherited or received as a gift, is separate property. Unlike community property, which the court has the right to divide “in a just and right manner,” separate property is protected constitutionally and the court cannot divide it. Note that all property in the community estate is presumed to be community, and the person claiming property that is separate has the burden of proof on that issue. If the divorcing parties are unable to reach an agreement on the division of the family residence, the general rule is that the house goes with the kids. The person who is the primary parent of the children will generally end up with the right of possession of the house, barring some unusual circumstances such as the primary parent is not employed or obviously cannot afford it. That goes along with the general rule that judges like to give children stability. If the choice is between one parent with whom the children are living and the other parent, the kids win. That does not mean that the other parent loses his or her interest in the real property. For spouses without children, other issues may determine what the court does, including whether one of the parents has minor stepchildren living in the home. Obviously, this is not the recommended way to settle a divorce, as arguing about everything increases the length of the proceedings, increases the cost and may also reduce the proceeds generated by the sale(s). So how does this relate to the sale of the family home? The bottom line is this — the spouses can agree to almost any division of assets as long as it is moral and legal (for example, it can’t place children at risk). One spouse can easily relinquish ownership of his/her share in the home by executing the proper warranty deed. Where problems often arise is when the home is the only large marital asset. Let’s say that a couple’s home currently has $100,000 in equity. If there aren’t $100,000 in other marital assets available to balance against this home equity, the relinquishing party has to be financially able to refinance or borrow from family or find some other way to compensate the other party. However, if, for example, the couple has $200,000 (or more) in total marital assets, an agreement could be reached where one spouse stays in the home (with any children) and accepts the $100,000 in home equity in return for transferring the other $100,000 to the other spouse. If one spouse has considerably greater assets (for example, vested stock options or retirement assets) than the other, an agreement could be reached where the wealthier spouse transfers all home equity and a portion of his/her existing assets to the other. In this scenario, the marital property is split in a just and right manner and further arguing and expense is avoided. So as you can see, the question of whether the family home will have to be sold as the result of a divorce is a question of numbers. Other wrinkles can arise — for example, what if one spouse used inherited money for the down payment on the family home? Even if the couple can reach a deal to transfer the property, the person who is relinquishing has to realize that his or her name will remain on the mortgage note until the property is divided or sold. Period. The judge cannot change that. The lawyer cannot change that. An agreement between the parties cannot change that. The lender is the only entity through which it can be changed, and in over 31 years of practicing law, I have never seen a lender release a party from a mortgage. 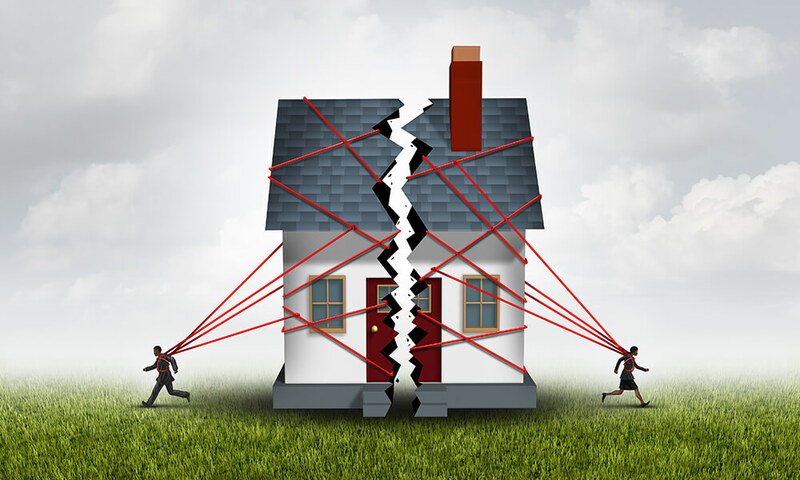 That leaves the relinquishing party at risk for late payments by the other party post-divorce affecting the credit of the relinquishing party for years down the road. At Essex Law, we work with a party who is not remaining in the home to insure that the divorce decree properly reflects any agreement for how he or she will receive the agreed-upon share of the equity, and also to protect the credit of that person. It takes creativity as well as knowledge, and the patience to educate the client, to be sure no nasty surprises await in the future.